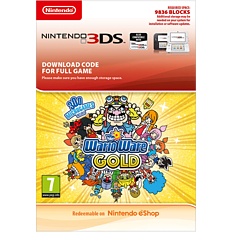 Join Wario and a colourful cast with WarioWare Gold, only on Nintendo 3DS. Wario returns with 300 microgames where you must a variety of skills on your device to become mini-game master! From fan-favourites to brand new minigames, there are a variety of fun and interesting mini-games that you must beat to try and walk away with the cash prize Wario is offering – but will he find a cruel scheme to not pay up the prize? Get ready to find yourself in some bizarre scenarios in the wild minigames. Buy WarioWare Gold on Nintendo 3DS today. Ready to be the mini-game master? Get WarioWare Gold on Nintendo 3DS today. Wario has realised he’s all out of cash and he needs to make some very quickly, and quickly plans a huge video game tournament to scheme his way to get money. To enter, you must submit 10 thousand coins and the prize is a huge 10 million thousand coins. Can you complete all the mini-games to walk away with the prize, or will scheming Wario get away without dishing out the prize? It can be intense and there are many opportunities to go back and re-tune your skills by re-playing microgames. Why not play against your friends in Battle Time mode to discover more of this wacky and weird world? There are so many ways to enjoy WarioWare. Think you can win the grand prize? Buy WarioWare on Nintendo 3DS today.